Roman copy of the 1st century CE after a Greek original of the 3rd century BCE. In 1913, F. Poulsen identified this bearded, older man as being Hypereides (389—322 B.C.). 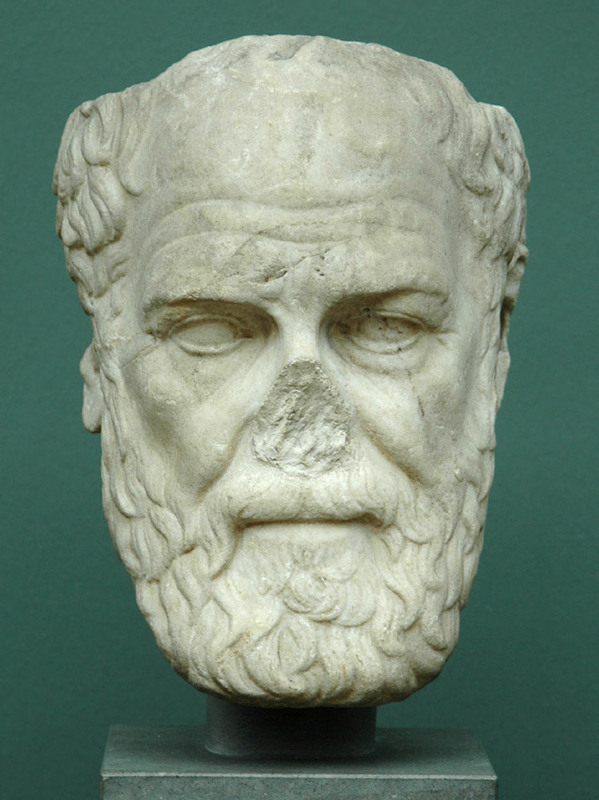 However, E. Minakaram-Hiesgen has suggested that Isocrates is the subject of the portrait. Neither of these designations has been certified through inscriptions. Original: 3rd cent. B.C. Copy: 1st cent. A.D. The nose is missing. The ears have been partially broken off. The hewing at the top of the head and at the neck indicates that this head was originally part of a double herm. This portrait was purchased in 1903 by Hartwig and is said to have been discovered by him, at Parma. F. Poulsen, Monuments et Mémoires, 21 (1913) 47—58. F. Poulsen 1951, Cat. 422. V. Poulsen, 1954, Cat. 21. H. Weber, Gnomon 27 (1955) 449. Richter, Portraits, II, 211, no. 5, Abb. 1362—1364. E. Minakaram-Hiesgen, JdI 85 (1970) 146: Isocrates. Griechische Porträts, herausg. K. Fittschen (1988) 176 ff, Taf. 82, 1—3. © 1992. Description: F. Johansen. Catalogue Greek portraits. Ny Carlsberg Glyptotek, 1992, p. 72, cat. no. 27.